We were lucky to have such a professional guide on our excursion to the Hermitage, and so kind and positive person as Maria! She tells about tiny details of one or another art objects with keen interest and passion so that all group is captured by her story reveling many new curious facts! Her English is very beautiful and adjusted to the group. Thank you so much, Maria! And I can’t wait to arrange another cultural trip with you! You must get Maria Kostina the best tour guide ever warm friendly kind helpful and hugely knowledgeable. What an amazing city from stunning winter and summer palaces to Maria taking us to everyday coffee and doughnut cafe for locals. 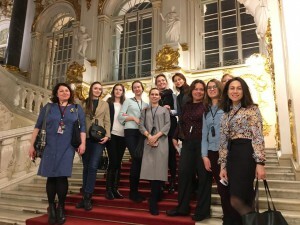 We visited St. Petersburg in October 2018 and arranged for a private tour with Maria for 22 people. I found Maria to be very professional, courteous and knowledgeable. Our visit was so much more enjoyable and worry free. Everything was carefully planned including good suggestions for lunch on both days. I highly recommend contacting her for future visits to SPB. 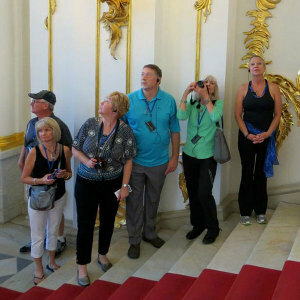 We were very pleased with our tour of St. Petersburg provided by Tourpetersburg.com. 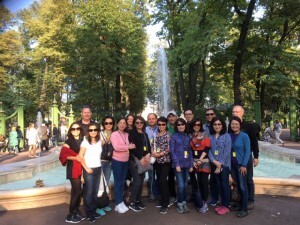 We had a group of 19 friends who had some specific requests for a two-day tour. We worked with Polina communicating back and forth via many e-mails, taking our strange requests and turning them into something practical. She was always very polite and patient. Among the complications was that 13 of us wanted to go to the ballet one evening, with 6 simply going back to the ship. On the morning of our arrival, a nice bus, an excellent driver and our fantastic guide, Maria, were waiting for us at the cruise ship terminal and we were quickly on our way. Among our requests was to get a bit beyond just the many churches and museums and get some taste for life in Russia. Maria worked it out very nicely, with non-tourist restaurants for lunches and dinner, a trip in the beautiful subway and walks in parks. Both Maria and the driver (who also spoke a little English) shared a bit about their personal lives and challenges people face in daily living. Timing and arrangements were perfect to get us into the most famous places without lines and excessive crowds. Maria’s knowledge of everything we visited was truly astounding, but when we asked some obscure question she didn’t know the answer to (only happened 4 times), rather than bluffing, she made calls and got us answers. If we ever get a chance to tour longer in St. Petersburg, we will certainly use Maria and Polina again and would recommend others do the same. We had a great time and learned a lot. 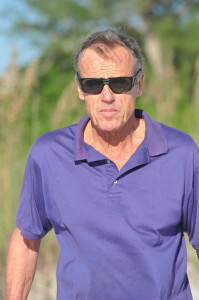 My wife and I booked 2 days with private tour guide, vehicle and Driver with Maria while we were there while on a cruise. Olga was our guide and she was excellent and was able to show us the city with great energy and knowledge. We would recommend booking with Tourpetersburg and with Olga. Maria was an excellent guide for our group of six for three days in St. Petersburg. We were able to make requests as to what we wanted to see and all of Maria’s suggestions were wonderful. 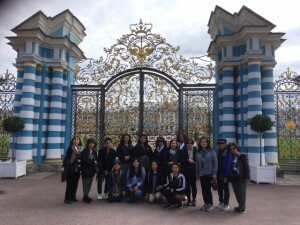 We especially enjoyed the many things to see in the Hermitage and Peterhof. Maria suggested authentic Russian restaurants for lunch, which we enjoyed (there were no other tourists). A highlight was seeing some relatives and Maria came to dinner for the evening with us and translated at a very minimal extra cost. We had previously communicated with the relatives through google translate as they do not speak English and we do not speak Russian. I want to visit Russia again. The positive experience was largely due to Maria’s skills, the information she provided, and her interest in making sure we had a great experience. 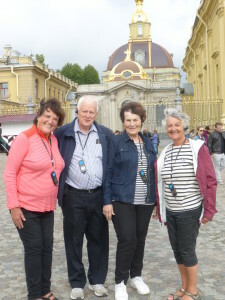 My family and friends (22 people)had a great time exploring the beautiful city of St Petersburg for 2 days during our Scandinavian/ St Petersburg Cruise last Aug 22/23, 2018. Maria our very knowledgeable guide showed us the different landmarks of the city(Hermitage museum, Peterhof Palace, Catherine Palace /Garden,Church of the Spilled Blood, St Isaac Church etc).We particularly enjoyed the specialty Russian breads during our quick lunches. Thank you Maria for your recommendation on these 2 days . The breads were delicious!! Maria was recommended to me by a friend. 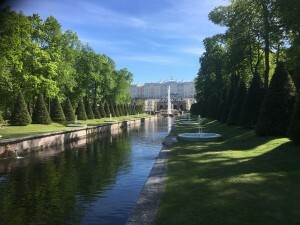 If you are on a cruise and have 2 days in St Petersburg then Maria’s guided tour will enable you to see as much as possible in the limited time with the most enjoyment. If you want a knowledgeable and pleasant guide taking you around in a nice chauffeured Mercedes then Maria will give you complete satisfaction. 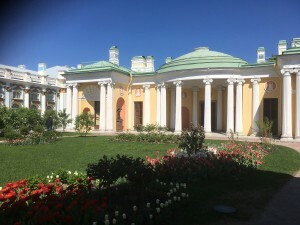 You will enjoy walking past the long queues trying to get into the Hermitage. The only problem with superb St Petersburg is that the rest of the world can be quite disappointing in comparison. Our family of 11 has nothing but compliments for Polina and Maria. I initially dealt with Polina to set up our 2 day custom tour and she was very informative–professional–and timely in all contacts with her. At the last minute minor changes were made due to long wait times at Catherines Palace and here again Polina’s suggestions were communicated professionally and thoughtfully.Our tour guide was Maria and she was simply outstanding. Everything was as promised with absolutely no surprises. Maria was very organized and amazingly worked thru minor changes to our itinerary to maximize our time. This company is simply outstanding to work with and have my highest recommendation. Excellent value for a quality tour!!! 2 days touring from cruise ship with our excellent guide Maria. Gave them a list of must-sees and they did the rest. We saw almost all of our must-sees and SO MUCH more. Maria uses her local knowledge and contacts to skip past or avoid lines. Flexible itinerary adapting on-the-fly to current conditions. Took us to nice spots for lunch that were very affordable and great food. Highly recommended. What a great city this is. What a fantastic tour you put together for us. What an excellent guide Tanya is. Not only is she extremely knowledgeable and excellent at her job but is one of the nicest persons we have had the pleasure of meeting. 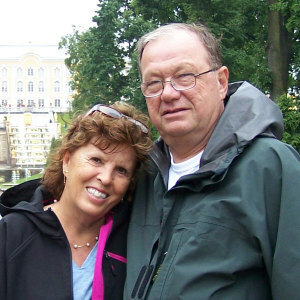 My family spent two beautiful days in St Petersburg with Maria during our Scandinavia cruise. She was extremely informative and organized throughout the tour and even went the extra mile to assist my elderly Italian parents. 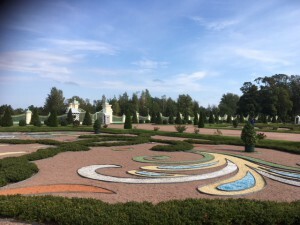 If you plan to visit St Petersburg, I highly recommend visiting this gem with Maria! 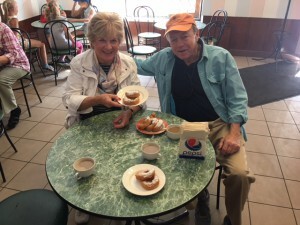 I want to thank you on behalf of Robert , Lucille , Shirley and myself for providing us with such great tour itineraries and exceptional service. Tatiana and Maria were great tour guides and very flexible and accommodated all our needs. Maxim was a great driver. Dealing with you all has been a most pleasurable experience and we will have no hesitation in recommending each and every one of you. Once again many thanks for making our stay in your beautiful city so memorable. Visit to St Petersburg for four adults. Contact throughout the booking with `Maria was excellent. From meeting Maria (and Anton the driver) at the port we felt welcomed and in good hands. Maria tailored the tour to our needs and in doing so we saw far more than we would have if we had booked an excursion through the ship. Nothing was too much trouble, Maria even booked a table for lunch at the Peterhof and arranged for us to visit (and ride) on the Metro. We also got to see the kitchens and bath house, which although are accessible to all are not usually included in a standard tour. 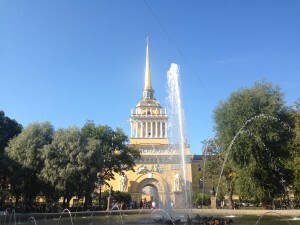 If you are thinking of booking a private tour in St Petersburg, you need to contact Maria! My wife and I took a Baltic Cruise this July. We found out that we either needed to get a visa, take a cruise “tour excursion”, or hire a private tour company. After lots of research, we chose Polina and TourPetersburg. It was the best decision of our trip. I contacted Polina back in March and she was so instructional, accommodating, and sweet. We weren’t easy, as we wanted not only a day trip to see all of St Petersburg’s main tourist attractions, but we also wanted to experience the nightlife. Polina came up with a perfect itinerary! 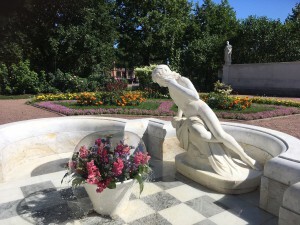 We were picked up at our cruise and saw all the sites we wanted to see (including the hermitage, the winter palace, the summer palace and the Church of Spilled Blood…not to mention the FIFA World Cup fan zone). Everything we asked to see, they showed us. We were then dropped back off at our ship for dinner and a quick nap. Our guide (Maria) met us back at the ship at 8 to take us on our own personalized pub crawl. Once again everything we asked for, we got! We were taken to a traditional Russian dinner /restaurant. We asked to go to an Irish Bar, Russian bar, and a bar where locals hung out. All were hit and exceeded expectations. Maria also took us to a few extra places. It was fantastic! I travel a lot and my expectations were higher. Maria was able to meet all of them. She was knowledgeable, friendly, and kind! Our driver (I can’t remember his name) was professional and courteous! We can’t thank Polina, Maria, and tourpetersburg enough. If we are ever lucky enough to venture back to Russia (or anywhere else in the Baltic’s, as th they have tours in places such as Riga and Tallin) we won’t heaitate to contact them again. Thanks for making our trip amazing! Thank you for the most interesting 2 days in St. Petersburg! Your professionalism, flexibility, and kindnesses are most appreciated, and about which we will be sharing with our friends. 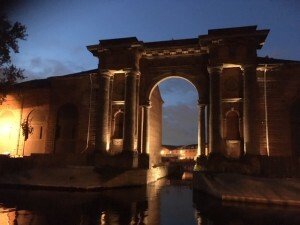 All of your combined efforts provided an excellent visit to such an astounding city, and I will be encouraging all of my clients to the Baltic area to experience your tours. 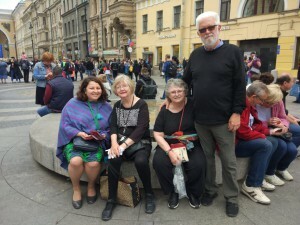 While on a Baltic cruise in June our friends and my wife and I had a free night in St Petersburg . 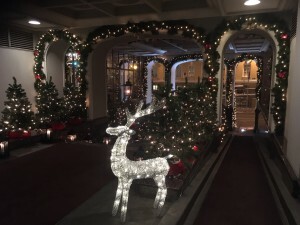 I contacted Maria a couple of months before leaving after seeing some internet posts and she was able to arrange a special evening tour of some very local pubs.they handled all the transportation, visa, and destination planning. It turned out to be the night of the Russia vs Egypt World Cup match. Maria adjusted the itinerary to go to at least local spots with all the World Cup fever and excitement. We had planned on 3 couples but 1 couple could not attend so 4 of us , a great driver and Maria. She took care of all our ordering, language help and lots of local color. On our 10 day Baltic tour our evening in St Petersburg was by far the highlight. I have taken many private tours in Europe and rate Maria number “1”. We are from California and in mid 60’s. Don’t miss a chance to give them a call. We had the most memorable experience at Saint Petersburg with Polina and Maria.We were a group of 8 people doing the Baltic Cruise. Polina helped us on an itinerary that covered everything we wanted to see.Maria was our guide. She is very knowledgeable and her English is excellent. She told us history of all the buildings and monuments and arts in n the museum. She took very good care of us. She arranged all location with the driver so we didn’t have to walk or wait. We enjoyed very much our time in Saint Petersburg and much thanks to Polina and Maria. We loved the tour and your beautiful city. Maria was terrific and VERY knowledgeable, always finding answers to our questions and we found Maxim to be very good driver. We will recommend you and your company to others in future. We had two magical days in St. Petersburg. It is an incredible city. We didn’t miss a thing. The city is gorgeous and maintained so beautifully. There are sumptuous gardens and forests throughout the city. Everything is sparkling clean and manicured. The architecture is so stunning. We visited museums, palaces, The Church of The Spilled Blood and an awesome synagogue. The food we had was different and very tasty. We had a terrific and knowledgable guide named Maria with a private driver. The highlight of our trip was dinner with a wonderful Russian family. Polina and her family invited us into their home and prepared a wonderful Russian dinner for us. We so enjoyed hearing about the life in Russia. We realized that the people and lifestyle are very similar to ours. They are friendly, affectionate and easy to be with. We really felt like family. We fell in love with the city and the people. We hope to return again. WISH I COULD GIVE THIS 8 STARS! Maria met us at the dock, and was the perfect hostess to show us her country. She is extremely knowledgeable both of the history and landmarks but also of the art at the Hermitage. She took us to some out of the way, authentic places to eat, and was an excellent companion as well as a guide. Very tuned into our needs. When we wished to sit, she waited for us and changed some parts of the itinerary as we made some requests. We were told about her by fiends and would never hesitate to recommend her highly.We three spent 2 days with her and our excellent driver. Thank you so much for taking such good care of us. We thoroughly enjoyed our visit to your beautiful city and also getting to know Maria! Bob was very pleased with your lovely birthday gift! Thank you again. 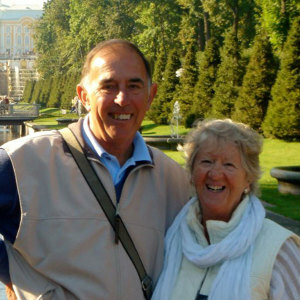 We will be passing your services onto our friends and family who may wish to visit St Petersburg in the future. St Petersburg went extremely well. We could not have asked for more from Maria who was exceptional: in guiding, helping and facilitating all we enjoyed. She was patient, considerate/thoughtful and careful; she understood and anticipated all our needs and went well beyond what can be expected of anyone. All members of our group said that she was the very best guide they have ever had in all their travels, and they are all well-travelled people. Please convey to her our deep appreciation. She was magnificent! In terms of attractions, they were all interesting and appreciated. There is nothing we would have omitted. The palaces were dazzling. Cathedrals stunning. Museums were excellent. Maria made them all come alive with her explanations (often patiently repeated, because we were not able to remember all the facts in one go). If there is one improvement to suggest it would be to allow much more time in the museums, eg. the Hermitage where we could have spent a full day. The shows (ballet, folk show) were thoroughly enjoyable. The itinerary for the last day in St Petersburg was very well scheduled, starting a bit later and ending with a short wait for the train at 2355 hrs. Maria saw us into the train. 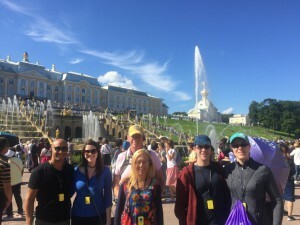 Lastly I want to again repeat that we were very pleased to have worked with TourPetersburg for our trip, and with how you went out of your way to help facilitate our trip. A great experience! This was about our 8th trip to St Petersburg and we have always used Tourpetersburg as they have always given us 100% satisfaction. It was our 45th wedding anniversary so a special occasion. Our guide was Katya this time and she was as professional as Lena was last time, she spoke perfect English, was kind and extremely helpful. We visited the Faberge museum and it was wonderful to see so many examples of perfection. 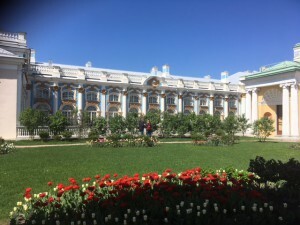 Polina always comes up with some new place for us to visit each trip and its worth asking her to recommend other things, other than the very obvious stunning palaces which should never be missed of course..
We had a 2 day stop over in St Petersburg on our Baltic Cruise. We contacted Maria at Tourpetersburg and received detailed options as to what she thought would suit our party of 4 adults and 6 teenagers. We were met at the customs hall in the port by Anna and spent 2 days with her on our private minibus. She took us to the most admired places in St Petersburg including the wonderful palace of Peterhof, the Hermitage, The Church of the Spilled Blood. 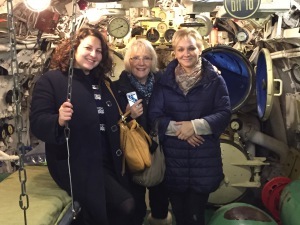 But what made the 2 days for us were the local details, taking us on the underground, going to a soviet cafe, and listening to Anna’s intelligent, informed and generous information and explanations. Anna made this trip extraordinary. I would absolutely recommend Tourpetersburg. I’ll be honest. I was a bit apprehensive about touring Russia. Our cruise ship allowed us only one day to see the sights and I didn’t see how that was possible with a large tour group from our ship. A friend of a friend told us about the Tourpetersburg group. For a couple of months Polina worked with me to arrange everything that we wanted to see. She personalized the tour for our group of 6 people. She even got us our visas. The day of the tour, Maria met us right outside customs, even waiting an hour and a half for us when we were stuck both on our ship and at customs for unexplained reasons. But once we met Maria the fun began. 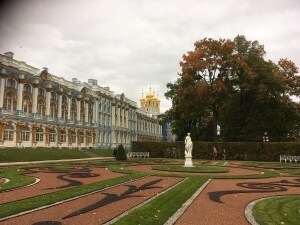 She took us on a tour of St. Petersburg, for a fun ride on a hydrofoil to Petershof, a great lunch back in St. Petersburg, shopping, then an amazing tour of the Hermitage, including the famed Gold Room. We went to other sights as well. George was an excellent driver of our comfortable van. Everywhere we went we got to skip the lines, saving so much time. Maria was so kind and knowledgeable. I feel sorry for everyone else who did not get to go on this tour! 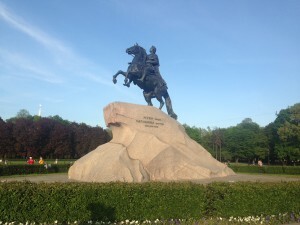 I highly recommend Tourpetersburg! 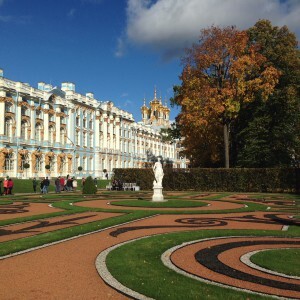 Our time in St. Petersburg was short, and we had lots on our list of places to see and do. Thankfully, this company allowed our group of 6 to pick and choose the sights and events that most interested us. The guide and driver both demonstrated exceptional ability to guide us in, through, and ahead of super crowded sights, which allowed us to make the most of our short time in their beautiful city. Choosing this company was one of the best decisions we made while on our trip this summer. We had two full days in St Petersburg as part of a cruise and arranged for private touring with Tourpetersburg for both days. We made arrangements by email with Maria, who answered all our questions quickly and efficiently. We wanted to see most, but not all, of the stops on the usual must-see tour of the city, but also wanted to add a stop of our own, which they were able to accommodate. I had previously reviewed the shore excursions offered by the cruise line. While the cost for private tours was a little, but not much, more, we were able to customize our tour and have our own private guide and vehicle, so it was well worth it. We are not people who usually take formal tours. When travelling, we mostly head into a city on our own and explore using local transport and our feet. 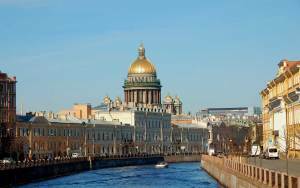 To see anything in a short time in St Petersburg, however, a guided tour is a must. First, it eliminates the hassle of getting the Russian visa that is required for most visitors. Second, it fast tracks you through the jaw-droppingly long lines that are at all of the main sites. 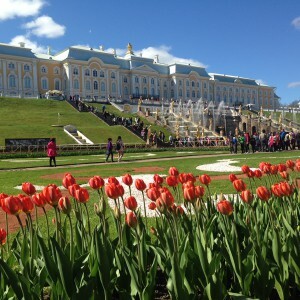 Third, it deals with transport to Peterhof & Catherines Palace, both of which are must sees. Fourth, it addresses the language difficulty… lots of signs are only in Russian, and in Cyrillic at that, making basic navigation and interactions like buying tickets, tricky. Our guide Katia, and driver Anton, were both great. Katia, as a native, was extremely knowledgeable and answered all our dumb questions. And I feel that we have learned enough about the city and how it works to find our way on our own if we are ever fortunate enough to visit again. Saint Petersburg was the highlight of our Baltic Sea cruise and we were very fortunate to have as out tour guide Maria and driver George. They allowed our group of 12 to make maximum use of our limited time and to see the highlights of the city. The tour was well organized and Maria was an excellent guide. She was knowledgeable, enthusiastic and made sure we saw all the highlights of the city. Even when we were a bit tired she was able to get us going with her enthusiasm and smile. We would highly recommend your tour to others. It was a pleasure to deal with Tour Petersburg! We were interested in different sites as this was our second trip to St Petersburg. Always prompt, Polina responded to our questions and provided excellent suggestions that only a very experienced tour operator could. Our most knowledgeable and congenial guide Elena was a pleasure to be with during our 2 day tour. Our driver Ruslan’s skill at getting us around should be mentioned as well. We would highly recommend this company and thank those mentioned for making our trip most memorable. First, I am somewhat remiss in posting late in that we were there about a month ago. But I cannot give TourPetersburg anything but the highest marks. 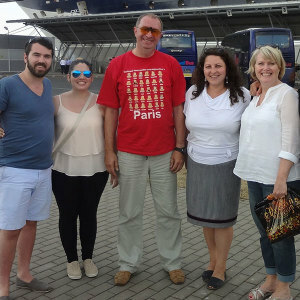 Maria and Polina and her family and George – our driver were wonderful. The schedule I requested was not easy, but it definitely delivered. We have done three different visits to SP. Once, on our own in 1999. 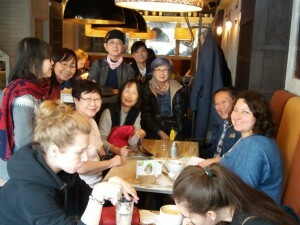 Second, with a group prior to TourPetersburg. 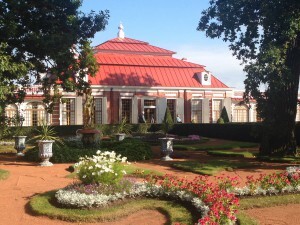 I asked to see the special rooms in the Hermitage – the Diamond Room and the Gold Room. Only two groups go at one time at appointed times and with a smaller number of people. You have a private guide/curator. Having Maria allowed us for easily translation. July 12 – We met Maria at 10:00 AM for our tour. We started at the University Embankment; visited the Egyptian Sphinxes (where she showed us how to “greet” them (they are from Napoleon’s time) – cover their ears and whisper in the cat’s ear. Then the Priviet, Rooslam, St. Isaac’s. By 10:40 AM we visited the Jewish Synagogue. Our tour group had driven by but not stopped. With TP, we had a local guide for an hour inside with Maria. It is the only such synagogue in SP. Then Maria gave us snacks and water as we traveled to the Russian Ethnographic Museum. 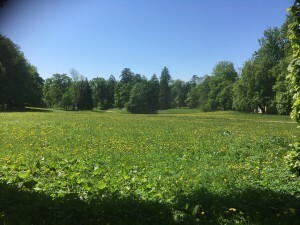 Back in the car by 1:00 PM, down to Smolny (nunnery) Monastery on Tapestry Road. 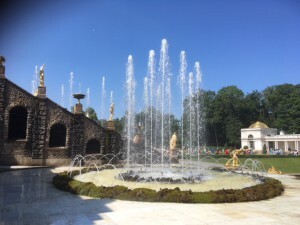 Past the Fountain River (which fed the fountains of Peter the Great). Lunch was pirogi – cabbage, lingonberry. Back in the car and to Trinity Church beautiful. 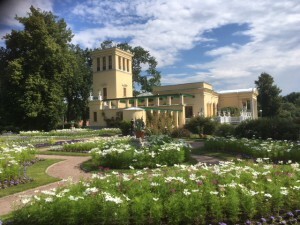 Then Catherine’s Garden (Catherine the Great II). Visit the Art Nouveau gourmet shop. One of the most amazing stores I have been in the world. Later we peek into a private courtyard with a mural of the Colosseum. Then St. Michael’s Castle (Peter’s first palace). We get to see a small bird built on the lower side of a river wall (our group had driven by). People try to drop a coin to land on it and get a wish. No luck for me. Now the Faberge Museum. You can go by yourself. But having Maria to explain everything was worth everything. She got us in early for our appointment and made it easy to see everything. “Amazingly great” is what my notes show. Then a special treat. But we were invited to dinner at Polina’s flat. 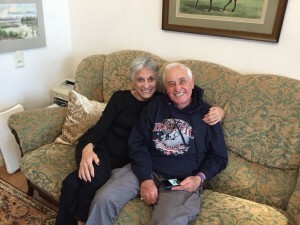 We had dinner with the family – her husband, two daughters, and Maria and George. An apple drink, vodka, borscht, sour cream, herring salad (w/beets), veg salad (w&w/o mayo), herring, black bread, blinis with jam, honey, cream (made by Maria’s mother!) A wonderful learning and eating experience. July 13 – 10:30 AM – Meet Masha (we found out at dinner that’s really her name, Maria is the name she uses for business). Uber to the Hermitage. We get priority entrance to the Hermitage and visit the Egyptian room and lots more (she is trying to show us things we haven’t seen) prior to our appointment. 12:15 PM, the Diamond Room – we felt very special. 1:20 PM the Gold Room. Both curator/guides wanted to keep us longer. Very nice. July 14 – Meet Masha and go to a tour of the special Metro stations in SP. Then the Siege (of Leningrad) Museum. All in two and a half days. Including transfer the first day from our group hotel to our new hotel and transfer to the airport the last day. Take note that George drove us to the airport and Masha came in. She was there as the security people decided to take my luggage apart – several times. Thank goodness she was there. 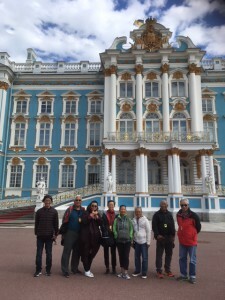 Yesterday we took a private tour arranged by TourPetersburg and it was fantastic! We discussed what we wanted with Polina who was terrific arranging a full day of sightseeing and she truly delivered a great experience. She even bought Russian sweets and sodas for us! Talk about professionalism and going the extra mile for the customer!!! Our tour guide was Maria who was knowledgeable, personable, and a delight. 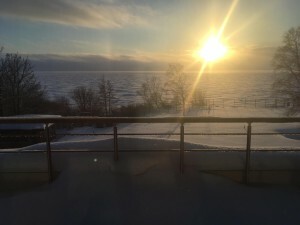 We left St. Petersburg wanting to return and have Polina and Maria arrange everything for us. 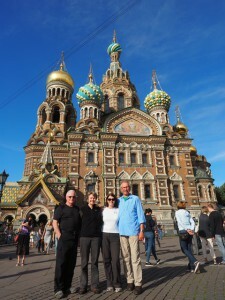 My friends and I had a two day tour of St. Petersburg with Maria and our driver whose name I could not possibly spell. I cannot sing enough high praises for them or for Polina who helped plan our tour. 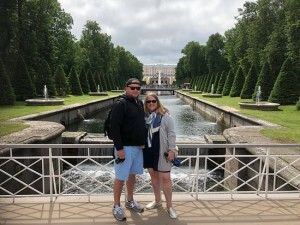 They answered our many emails sent prior to our trip and sent an itinerary that included many of the St. Petersburg highlights. It took forever to go through immigration from our cruise ship. Maria was patiently waiting for us through all the madness. The Mercedes van had snacks and drinks waiting for us. St.Petersburg is an amazing city. There were many sights to see and Maria was able to explain the history of Russia and the importance of each sight. We always felt like VIPs with no line waiting and personal service. They were able to customize the things we wanted to do such as see a subway station and go to a restaurant and bars that locals would go to. We were constantly amazed and impressed. For the two days we were so much was packed in and ample time at each of our sights. Send me a message if you have any questions. I cannot express how much I loved and enjoyed this tour. This was an absolutely amazing tour of beautiful St. Petersburg. Our tour guide Maria, our driver Yelisyeyi (Елисей) and owner Polina really know the city and the best way to show it off. My group of four adults arrived at 9 am via the Norwegian Getaway at the Port in St. Petersburg. After negotiating long lines at Russian customs we found Maria waiting and we were whisked away to explore and enjoy as much as we could during our two-day visit. We created an a la cart tour that included sightseeing, restaurants, evening cocktails, the Hermitage museum, churches, tombs, coffee and much more. As a small group we easily moved through the city and sites. Maria is extremely knowledgeable, very well versed in Russian history and culture, excellent English, and well connected…Maria seemed to know everybody. Our driver knew every route and navigated the city effortlessly. My favorite thing about the tour is I feel like I was really shown the history, culture and life of St. Petersburg. Our visit to a farmers market was a simple highlight that allowed us a glimpse everyday St. Petersburg life. I wish I had prepared more before my visit to educate myself on basic Russian history and modern Russian culture, I feel this would have improved my experience. Our summer weather was beautiful and sunny. We walked and were on the move from 9am to 11pm then 8am to 5pm, so comfy shoes, sunscreen, camera, and cash or card for souvenir shopping. Overall this was a spectacular experience and the highlight of our visit to the Baltic Sea. Excellent tour with an excellent guide. Loved the impressionists section that you wouldn’t see on regular shore excursions and was lovely seeing the faberge eggs without the crowds. Would highly recommend this tour company. Can’t say enough wonderful things about our 2 days of touring in SPB. Maria took such good care of me on my 1st day and customized our 1/2 day so i could see exactly what I wanted. Elena took over on day 2 and we walked the city with my husband and also saw exactly what we wanted to see. The depth and breadth of knowledge about the history, the architecture, the artists and their work was so detailed and substantial. We were so impressed. Hope to get back someday for more! I would like to express my gratitude and appreciation to Ms Polina Kurshakova of Tour Petersburg for the excellent service provided to my group recently on our visit to St Petersburg in early October 2016 . 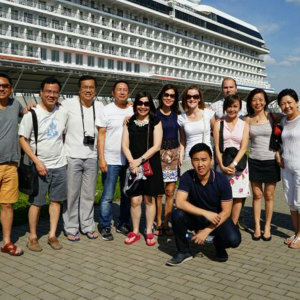 The itenary that was prepared was cleverly and delightfully planned in accordance to our expectations , and the service of the tour guide Ms Tatiana , was indeed very professional , competent and simply adorable . My group had a wonderful time and thoroughly enjoyed themselves . Certainly a well organised company which i will have no hesitation to fully recommend to all who wishes to be well taken cared of whilst visiting St Petersburg . My regards and congratulations to Polina and her Management , wishing her every success in her undertakings , and i will continue to give her my support with repeat businesses and referrals to all my group of friends , family and work colleagues visiting Russia in the near future . Saint Petersburg was the highlight of our Baltic Sea cruise and we were very fortunate to have as out tour guide Maria and driver George. They allowed our group of 6 to make maximum use of our limited time and to see the sights we were really interested in. Maria was exceptionally knowledgeable about the city and very efficient in arranging for tickets so we didn’t spend a lot of time in lineups. We would highly recommend Tourpetersburg to anyone planning a trip to Russia. It was our pleasure to spend 3 days with Maria and Ruslan. We had a good time and found the schedule full and to our satisfaction. There was so much to see. One could easily spend 2 weeks in St. Petersburg and barely scratch the surface. 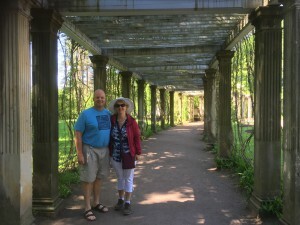 We were happy to get the tour that we did and found both Maria and Ruslan to be excellent. 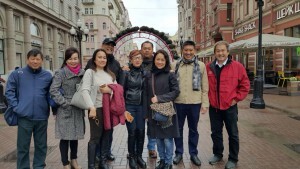 We will certainly recommend you and your company to others wishing to go to St. Petersburg or other places in Russia as I understand that you also run tours in other cities. If we ever return, we will be sure to connect with you again. Our three-day St.Petersburg visit exceeded expectations. I gave you a rather long list of sights that I wanted to see and you fit them in our schedule in an orderly and sensible way. As things worked out, there were no “hitches” or delays, and all the details were as we had agreed upon. Our guide and driver were courteous, helpful and well informed. And, just as important, they impressed us as being genuinely nice, trustworthy people whose company we enjoyed. I would certainly recommend you and your company. It was a blessing that we found Polina `s company on the net so we can book our two days in St Petersburgh with her. The guide was extremely well-informed about all the sites we visited. Her historical and artistic knowledge were exactly what we were looking for. Travel in and out of the city was perfect and always in time and according to the schedule. Our driver was an additional asset (helped us to get to our show as well) and worked fantastic with our guide . The schedule included 2 full days and she was always flexible when we requested a diversion or wanted to spend more time at a location. Her choice of restaurants was excellent and the prices excelent for the quality of food and service. 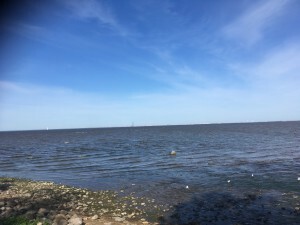 Our recommendation for anybody that want to visit St Petersburgh will be to get in contact with Polina because you will have the best service that you can ask for. Polina was our guide for 3 full and fabulous days. We worked with her in advance on what we wanted to see and she arranged everything perfectly and to fit our schedule. She was great to be with and extremely knowledgable ,and spoke very good English. ( She taught English ) . She arranged a driver but only where needed to keep costs in line. The car was very comfortable and well worth it. We never waited in lines and truly enjoyed our days with her. She was prompt,courteous ,sincere and looked after everything. I highly recommend her. 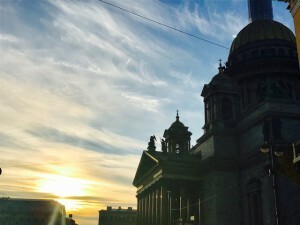 On a 12-day cruise in the Baltic my favorite place was St.Petersburg, Russia. Our guide was Ms. Polina Kurshakova. She is the reason our 3-day St.Petersburg guided tour there was so perfect and our favorite port of call. I am so glad we did this St.Petersburg individual tour and did not pile on a bus with a lot of grumpy people. Excellent English, and she was always so concerned about how we were. She helped to plan our three days there. I did not know where to start. 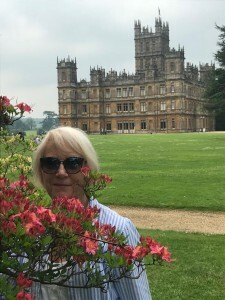 I have not stopped talking about her and St.Petersburg private tours she sets up. Our time there was too short. Polina, you are as pretty on the ouside as you are on the inside. I love your city-St Petersburg, Russia. 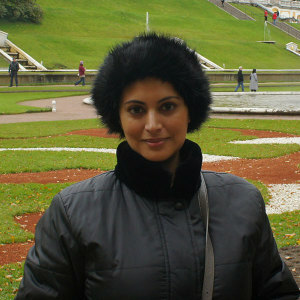 Our St.Petersburg guide was Maria and she made all places in Saint-Petersburg we visited so memorable. Excellent English and an outstanding knowledge of Russian and Art history. She organized everything, bypassed all the queues and made sure we saw all the important things without rushing and even arranged a trip to the local restaurants for lunch. Brilliant!! 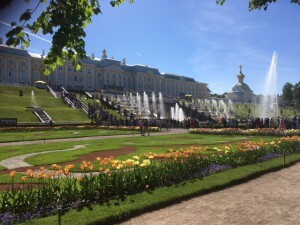 Maria, thank you again for your excellent private Hermitage, Peterhof and Amber Room tours during our visit to St Petersburg, Russia. August is the busiest time of the year but you were able to move us through the venues and the city with finesse usually at the head of the line. 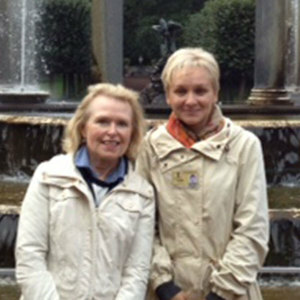 Your knowledge of the history and art of Russia made your St.Petersburg private tours very worthwhile. Your command of English was spot on and entertaining. Hugs from the eight of us. Maria was our St.Petersburg private guide for two days. The days were full, informative and fun. Maria ushered us around and made St.Petersburg trip VERY easy. We entered sites without waiting in lines – which were all VERY long – and she pre-arranged lunches. 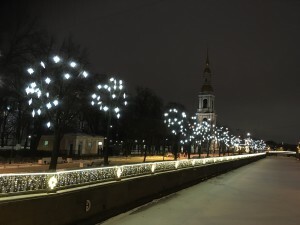 The days in Saint-Petersburg went from 07:45 to 17:30. We would highly recommend Maria as the best St.Petersburg travel guide. Thank you, Maria, for two great days. About a week before I left for my Baltic cruise to Saint-Petersburg, I was given Polina’s contact. I emailed her on a Friday night requesting to arrange a 3-day St.Petersburg tour package that mirrored the ship’s land tour for my party of 11. By Monday, she had arranged everything including our visas! On top of that, she did not even ask us for a deposit. The cost was less than half the price of the ship’s tour. 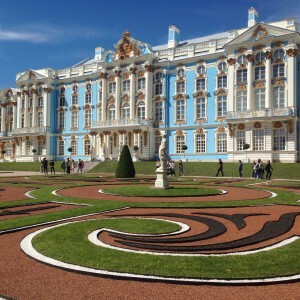 The 3-day St.Petersburg private tour was simply fantastic! 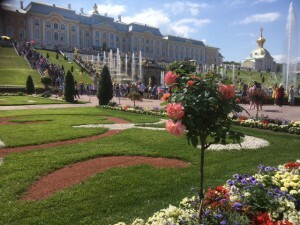 It included all St.Petersburg places to visit, Hermitage tour, Peterhof tour also. Our guide, Dasha was incredibly knowledgeable, very professional and engaging. She looked after the group extremely well. We have travelled extensively and this is the best private tour we had.